I figure it is beter to cross myself than it is to cross a friend. MPAA Rating: R for Rated R for graphic bloody violence, strong language, sexuality and brief drug use. It is very difficult to make a good, and funny, black comedy that deals with the mob. The Coen brothers did it with Miller's Crossing and now comes Adam Bernsteins's attempt with his film Six Ways To Sunday. Bernstein, whose previous film was the dismal It's Pat, does an admirable job but stumbles along the way. Reedus plays Harry Odum, a virginal teenager in Youngstown, Ohio, who divides his time between caring for his overprotective mother (Harry) and engaging in low-rent liquor store hold ups with his childhood friend Arnie (Brody). Arnie is a marginally disturbed street punk with a bad hip-hop affectation. When Arnie goes down for a botched robbery attempt, Harry is left to fend for himself and soon comes to the attention of Abie Pinkwise (Appel), a lieutenant in the local Jewish mob. Taking Harry as his own, Abie molds the brash, fist-happy kid into his own right-hand man, setting him as an enforcer and even going so far as to help him score a date with the consigliere's (D'amato) immigrant housekeeper Iris (Lowensohn). Love and bullets rarely mix, however, and Harry's mother is soon out to slow down her son's developing libido and ensure that mama's little boy never leaves mama behind. 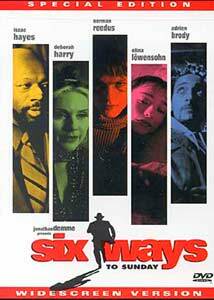 It isn't that Six Ways To Sunday is a bad movie, it has some very good moments scattered throughout the film. But they are too few and far between for them to add up to anything worthwhile. The problem with the film is that it never really decides what type of story it wants to tell. At one point it seems more suited to be a modern day Oedipus story than a mob film. Bernstein does a fine job behind the camera, shooting the script that he co-wrote with Marc Gerald. While some scenes are stylishly conceived, overall Six Ways To Sunday has the makings of a good movie but never really comes together. Reedus does an admirable job portraying Harry despite the fact the character is not especially complex. Lowensohn is without a doubt the best member of this cast, playing the sweet natured Iris with the perfect amount of innocence. On the other hand, Deborah Harry stumbles her way through what should have been a very complex performance as Harry's mother. Other supporting actors such as Isaac Hayes, Adrien Brody, and Peter Appel do well. Image Transfer Review: The 1.85:1 anamorphic transfer for Six Ways To Sunday is a very nice effort, and the best I have seen from an A-Pix title. While the film has an intentionally dirty look, the sharpness and detail in this transfer are handled nicely. Black levels are good, and the muted colors come off well. There is very little visible grain. This is a nice transfer from the folks at A-Pix. Audio Transfer Review: The 5.1 Dolby Digital soundtrack for Six Ways To Sunday is a bit more aggressive than I thought it would be when I put in the disc. There is quite a bit of activity in the surround speakers throughout the film. The dialogue is clear and easy to understand. The left and right speaker composition is well done. There is a .1 LFE channel, but it very rarely comes alive. A less active Dolby Surround 2.0 mix is also offered. Extras Review: A theatrical trailer for the film is included as the only extra on the disc. Six Ways To Sunday is more or less a toss up for me. It is a film that has great promise as a fairly straightforward mob story, but other moments in the film seem like they just don't belong. The complete lack of extras doesn't help the disc, but if you are looking for a black mob comedy you could do worse than Six Ways To Sunday.